Though our past hikes on the Milford Track/New Zealand, Inca Trail/Machu Picchu, Glacier/US, and various areas of Switzerland/Austria were particularly memorable, I must confess that the hiking, horseback riding, and spectacular setting of relatively inaccessible Patagonia is unparalleled. The critical contrast is Patagonia’s pristine remoteness: no mass tourism or crowded hiking trails here! When hiking a wide range of areas on the Patagonian Andes, it is easy to see how Torres del Paine still has hundreds of unnamed mountains, with many points inaccessible and unexplored. Located at the tip of the South American continent, the outstanding national parks and private reserves stretch 1242 miles across the Andean wilderness. Interestingly, during my last visit with a small party of 5 Explora hikers, we had several opportunities to observe giant condors flying overhead, while never seeing another human being outside of our own tiny group! 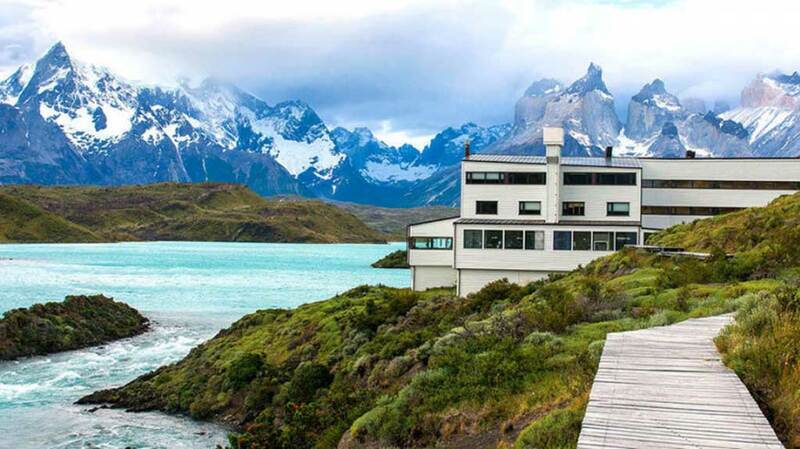 The extraordinary 49-room Explora Patagonia is our favorite luxury lodge in the entire 1,242 ft. stretch of the Patagonia Andes, located in the unspoiled Torres del Paine National Park, the very heart of Patagonia. Despite its remote location, Explora Patagonia provides all essential luxuries with such subtlety so the guest can marvel in this pristine environment without distraction. Perhaps not as architecturally striking as the Singular, the Explora more than makes up for it with one of the most spectacularly picturesque settings of any lodge we have stayed at anywhere in the world (!). Explora’s luxurious amenities include open-air Jacuzzis, a heated pool, spa, sauna, Chilean bar, and its own horse stable. With the area’s highest quality guides, wonderful food selections, and many hiking/horseback riding options, this place is certainly worthy of a 4-night stay. Of special note, Explora is the only lodge in Patagonia with its own bred and trained stable of 26 horses (including Arabian!). All horses have been raised on the Ibanez Estate, not far from the Explora property. Depending on your physical fitness level and general hiking interests, Explora offers a wide variety of hiking options ranging from a 1-3 hours trek to a full day (8-10 hours). Of the more rigorous hikes, the Base Torres Hike passes through the lush Ascencio River Valley and Chilean Refugio Valley, leading to the base of the majestic Paine Towers. This is a full-day 8 hour excursion. For a shorter, more relaxing excursion, the Lago Grey Hike begins by crossing the hanging bridge over the torrential Pingo River, walking through a lenga forest until you reach the shores of Lake Grey, generally quite windy, where you will be able to see the enormous icebergs that break off the Grey Glacier. Similar to hiking, Explora offers various horseback riding options including a family beginner level (45 min. – 1 hr. ), as well as more demanding, full-day rides for more experienced riders, with ascents of 486 to 762 ft. Dedicated to preserving the environment of Patagonia, Explora’s policy consists if three tenants: a commitment to the environment, support and involvement with local communities, and research. The hotel is designed to maximize the use of natural light and limit their electrical power consumption in addition to featuring its own on-site water treatment plant allowing Explora to supply each traveler with fresh water throughout their hikes. Each guide is meticulously trained to leave no impact on the environment, respecting the frailty of the eco-system. In 2014, Explora joined with the Fundación AMA Torres del Paine and the Corporación Nacional Forestal (CONAF) to commit to playing an active part in the reforestation of Torres del Paine National Park. Rest easy here knowing that you’re enjoying this natural wonder without leaving a heavy environmental footprint. The luxury, 57-room Singular Patagonia Hotel is located in the Chilean Patagonia on the shore of the Senoret Channel, a 5-minute drive from the town of Puerto Natales. Strategically located at the end of the “Ultima Esperanza Sound,” we feel it is the ideal first gateway point to many areas in/around Torres del Paine. Set in a National Historic Landmark, the site of an early 20th century meatpacking plant, its conversion to a 5-star luxury adventure lodge is truly remarkable. In contrast to the preserved, historic meatpacking section of the Singular, the hotel’s public areas and rooms embody a striking, modern aesthetic; the antithesis of the property’s National Historic Landmark status. The quality and diversity of dining options here is outstanding – among the most delicious meals we have had anywhere in South America (think “Naha” in Chicago!). Also, the homemade ice cream here is the best I have had anywhere! Please note that due to high-demand, spa reservations must be made a month in advance. You may opt for a half-day hike for all levels of experience. Trekking to the Mylodon Caves, one of Singular’s beginner hikes, is one of the most important archeological and paleontological sites in S. Patagonia. These caves hold evidence of human presence dating back to 12,000 B.C. Meandering through various caves in the area, the excursion leads to the Large Mylodon Cave; 200 meters deep & 80 meters wide. For those who want more of a challenge, Trekking Mirador Dorotea reveals the truly magnificent fauna offered in this national park such as the Antarctic beech and lenga forests. The hike’s peak height reaches 600 meters above sea level, allowing for a fabulous panoramic view. On my April 2017 visit, while hiking with the Singular guide, Andrea, I was amazed by the spectacle of 4 condors flying over us for over 20 minutes! With the condor nest just below the Mirador Dorotea’s peak, this is an ideal trek for a chance to observe these giant birds. In-house manager, Valentin Virasoro, and his staff create an intimate, family-style, atmosphere at Eolo that makes you feel most welcome. With only 17 suites, this simple, upscale lodge, located approx. 15 miles from El Calafate, is truly a heavenly ranch-style property. All rooms offer varying sweeping views of Lago Anita Valley, Ago Argentino, and Torres del Paine. Similar to other high-end lodges in Patagonia, Eolo offers extensive hiking, biking, and horseback riding activities in the surrounding picturesque areas. Please note: we arrange a separate private tour excursion to Perito Moreno Glacier from Eolo. The lodge includes a small indoor pool and a TV room for those who need a CNN fix. Noted chef, Juan Pablo Bonaver, makes dinner here a delicious, fine dining experience, though no fancy clothes required. No exaggeration in saying that the braised lamb I had here was perhaps the most tender and delicious I have had anywhere. Among the planet’s most dynamic and accessible ice fields, Glacier Perito Moreno is the remarkable centerpiece of the southern part of Parque Nacional Los Glaciares. Referred to locally as Glaciar Moreno, it measures 18 miles long, 3 miles wide, and nearly 200 feet high (approximately 20 stories!). Incredibly, the unique feature of Moreno is the ice is in continuous advance; up to 6-7 feet per day (! )causing huge icebergs to fall from its face every few minutes. To fully observe and hear the sensation of the falling ice is a rare, singular experience! This glacier is one of the most awe-inspiring natural forces on earth. Experiencing the glacier via wooden walkways or trekking on the actual glacier with crampons, the Perito Moreno is not something you want to pass up while visiting the southern cone. To be in the presence of the glacier emits the feeling that you are in another world. Its vastness envelopes you and you feel you cannot look away. It is truly a natural force that cannot be captured by film or photograph!